Dating back to the Depression-era Civilian Conservation Corps (CCC), Service and Conservation Corps have helped restore and improve America’s parks, forests, refuges and other natural spaces. Unfortunately, years of pollution, neglect and deferred maintenance have threatened the integrity of our treasured wild places. Corps take on this challenge by completing cost-effective, high-quality projects across the U.S. that support healthy environments, expand opportunities for outdoor recreation, and help train thousands of diverse young adults to become America’s next generation of land/water managers and conservation leaders. Created through President Obama’s America’s Great Outdoors Initiative (AGO), the 21st Century Conservation Service Corps (21CSC) is a bold national effort to put young Americans and veterans to work protecting, restoring, and enhancing America’s great outdoors. Built on the legacy of the Civilian Conservation Corps, the 21CSC will complete high quality, cost effective projects on public and tribal lands and waters across the nation. 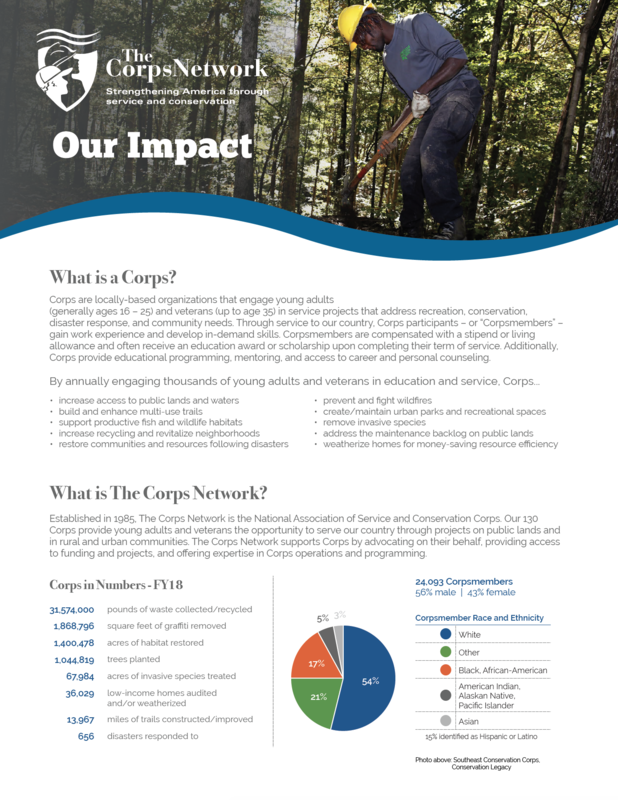 As a co-chair of the Partnership for the 21CSC, The Corps Network is actively involved in bringing the 21CSC to scale. Many of our member Corps are official 21CSC programs. The Corps Network is building Conservation Corps capacity in the five Gulf States – Texas, Louisiana, Mississippi, Alabama and Florida – to train local youth in environmental restoration and restore coastal habitats that have been damaged in recent years by disasters including hurricanes and the Deepwater Horizon oil spill. Several Corps operate conservation service programs specifically for returning veterans. These programs help veterans transition to civilian life by leveraging their leadership experience and desire to do meaningful work to meet pressing conservation needs on public lands. The basic program model allows veterans to serve together full-time for ten or more weeks completing conservation projects focused on wildfire protection, recreation enhancement, and habitat restoration. For many participants, the Corps experience has transitioned into employment with land management agencies like the U.S. Forest Service. Many Corps are located in big cities and play an important role in maintaining parks, supporting a healthy tree canopy, and operating urban farms and gardens. Urban Corps have been involved in building playgrounds, planting trees, transforming abandoned lots into green spaces, building rooftop gardens, and growing fresh fruits and vegetables in neighborhoods with limited access to healthy food. In addition to keeping cities green, Corps keep cities clean through graffiti abatement efforts, operating recycling programs, and working with local schools to teach kids the importance of being environmentally friendly. Read our article on Corps farms in the Huffington Post.